Hi all, hope you are all well. My creation today is using one of the gorgeous new images from Bizzy Bec's, she is from the Blue Butterfly 'Sweethearts' range, isn't she just adorable and she is gorgeous to colour, as are all the images. 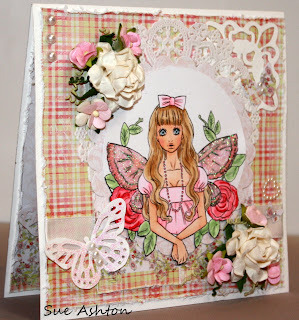 I coloured her with Copic's and used Stickles for her wings, the DP is by Prima's 'Sparkling Spring' Collection. Everything on the card (except the Martha Stewart' Butterfly punch) are available from Bizzy Bec's on-line store. Blue Butterfly Digi Images are ALL on Special at $2.00 each.. Offer ends 24th July 2011.. So pretty Sue, she looks just lovely.